Many people dream of having a single control that just makes things sound better — and while Soundtheory’s Gullfoss isn’t quite that simple, it is capable of extraordinary results despite having only five user parameters and an operation manual just one page long. Currently, the plug-in is available for Mac OS only, in AU, VST and AAX formats. It comes with one computer-based authorisation plus a number of further online authorisations to allow you to put Gullfoss on multiple machines; online authorisations require the computer to be connected to the Internet during use, and only one of them can be used at any one time. While the user interface is simple, what goes on behind the scenes is apparently very complex, and is based on a model of human auditory perception. This model then adjusts the EQ curve of the signal being processed in a dynamic way to maximise clarity according to your parameter settings and the nature of the input signal. Apparently Gullfoss also helps to counter the side-effects of phase problems, such as the temporal smearing introduced by minimum-phase EQs and multi-mic setups. In addition to proprietary perception modelling, new precision EQ technology was developed for this plug-in to avoid artifacts when the EQ curve is being modulated quickly. The EQ algorithm is designed to avoid overshoots and audible ringing. The two main parameters are Recover and Tame. Recover accentuates those elements that are in danger of getting masked by other sounds, while Tame suppresses those over-dominant sounds responsible for the masking. 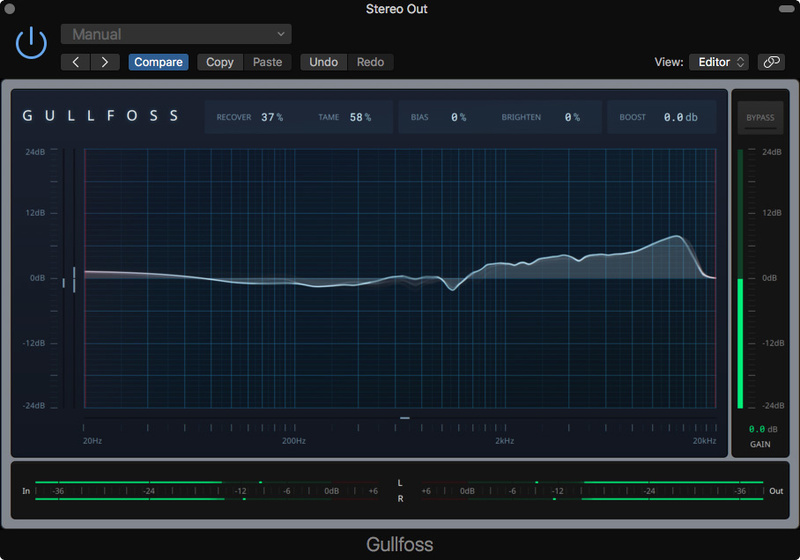 Both have their own amount percentage controls, and a third control called Bias determines how Gullfoss reacts in situations where it is less clear whether Recover or Tame would be most appropriate. Positive Bias values favour the Recovery mode at lower signal levels, while negative values lean towards the Tame mode. While Gullfoss matches the subjective level of the output to the input, it is designed not to adversely impact the dynamics of the treated signal — indeed, in the case of an over-compressed or over-limited signal, a useful degree of dynamic improvement can be made to transients. This was certainly borne out in my tests, where some delicate percussion that was in danger of getting buried in the mix came across much more cleanly. The next control, Brighten, adjusts the overall tonality of the processed signal; as its name suggests, it can be used to lift the top end, but it can also be set to a negative value to reduce the highs if the source is already too bright. Finally, there’s a Boost setting, but this isn’t just a level control; it also affects the overall tonal balance in a way that reflects the way human hearing perception changes with level. Its action is to some extent based on the familiar Fletcher-Munson equal loudness curves, but there’s more to it than that, as it also has a dynamic impact on the EQ rather than applying a static curve — increasing Boost emphasises bass frequencies while cutting back the mids. Actual output level can be adjusted using the vertical slider at the right of the plug-in window. In situations where you don’t want Gullfoss to treat the entire audio spectrum, there are upper and lower frequency markers that can be dragged to limit the band of frequencies within which processing takes place. This is useful when you want the plug-in to perform a specific task such as de-essing, or the two markers can be swapped over to exclude a section of the spectrum from processing. There’s plenty of visual feedback to show you what’s happening. The EQ curve continually moves as it adapts to the signal being processed, only reverting to a flat line when the input is completely silent, and the Bias, Recover and Tame parameters have their own metering, which is displayed to the left of the screen. The meter for Bias shows whether Recover or Tame is currently active, while the Recover and Tame meters are combined in a split meter view, with Recover denoted by the top displayed bar and Tame by the bottom. There are also horizontal input and output level meters at the bottom of the screen. The correct adjustment for the Recover and Tame parameters is often just a matter of listening and dialling in what sounds best. I found Gullfoss most effective on complete mixes or submixes as that’s really what it is designed for, though it can also be beneficial in improving the focus of individual tracks too, especially if they are clouded by reverb or recorded with more than one mic. 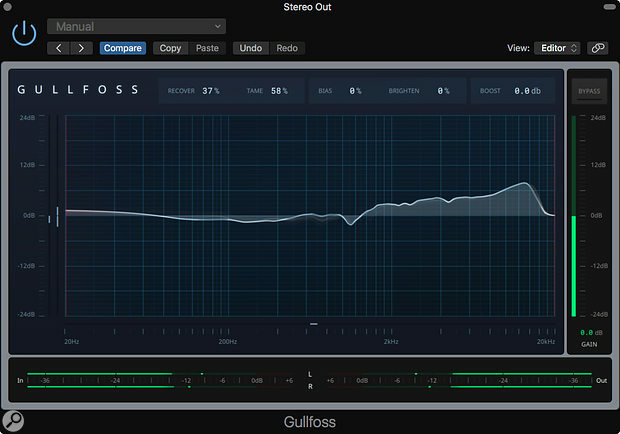 Apparently the designer makes extensive use of Gullfoss in his own projects to clean up mixdowns of multi-microphone recordings starting with equal settings of Tame and Recover, usually in the 20 to 50 percent range with Bias left set at zero. A gentle treatment certainly helps lift vocals out of a mix without making anything sound unnatural. Where prominent narrow peaks are evident, Tame is the first parameter to try; here, Bias acts as a kind of threshold control so that when set appropriately, only the resonances are processed. Recover, Brighten and Boost can then be used to match the tonal balance of the output to the original. In cases where the issue isn’t obvious, starting with Recover is usually a good plan, though it should be used with care if the material is noisy, as it can bring up the noise level; unless the track has completely silent sections, the EQ will still carry on trying to ‘fix’ any residual noise as it would valid signal. The manual tells us that Gullfoss always attempts to create an optimum tonal balance, and that if it seems always to be adding cut or boost at one part of the spectrum, that might indicate that your raw material needs to be mixed with a better EQ balance. If the amount of high-frequency lift is slightly more than you need with the Brightness and Boost controls set at neutral, a small tweak of the Brightness (negative) and Boost (positive) controls should get the overall mix tonality back to sounding the way you like it. So, does it work? Well, yes, it really does, adding a natural-sounding sheen of clarity to a mix while also helping lift out detail. It’s as if all the sonic fog that fills up the space between instruments is being pushed back. Percussion sounds really benefit, and the whole mix seems to come into better focus right across the spectrum. In most instances, I used a little bit of both Recover and Tame, adding a hint of Boost to balance any sense of added top end. The dancing EQ display gives you a good guide to what is happening as you adjust the controls. For all of its magic, the changes are for the most part suitably subtle if you set the parameters sensibly. In well-mixed parts of a song you may hear little difference, but then elsewhere in the track the effect may be more profound as Gullfoss decides that more work needs to be done. The masking effect of reverb tails and fizzy pad parts is addressed to improve clarity, and in most cases, the end result is less fatiguing to listen to than the unprocessed version, presumably because your brain doesn’t have to work so hard to hear all the elements. Of course you can overdo it if you max out all the controls for no good reason, but as long as you keep comparing what you have done with the sound when the plug-in is bypassed, you shouldn’t get into trouble. For a plug-in to make such a significant improvement with so few controls is an impressive achievement. The closest plug-in I’ve used for bringing a sense of focus to a mix is Noveltech’s Character, though Gullfoss is much more controllable. Also similar in concept are Oeksound’s Soothe and Sonible’s Smart:EQ. One of the most mysterious aspects of this plug-in is its name, apparently taken from an Icelandic waterfall. I wasn’t sure what that had to do with an automated EQ plug-in, so I asked Soundtheory’s Andreas Tell, who told me that the sound of the Gullfoss Waterfall — which is close to pink noise — inspired him to think about the problems that led to the development of this plug-in. Adds a natural-sounding clarity to mixes. Treats the whole audio spectrum, not just the high frequencies. Gullfoss adds a sheen of polish and clarity to mixes and submixes without making things sound unnatural or artificially bright.